Ivonne Coll Photos, News, and Videos | Just Jared Jr.
Justin Baldoni and Brett Dier hang out inside the CBS, CW, Showtime Summer TCA Party held at Pacific Design Center on Wednesday night (August 10) in West Hollywood, Calif. 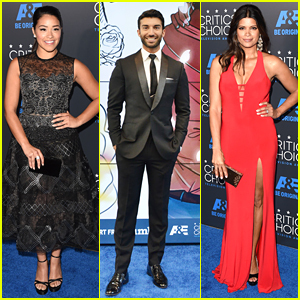 The two Jane The Virgin actors joined co-stars Gina Rodriguez and Ivonne Coll at the bash, just a few days after kicking off production on the new season of their CW show. Lucy Fry, Kerris Dorsey and Hunter King are also pictured arriving for the annual bash. Adelaide Kane and her fellow Queen, Rachel Skarsten arrive in style at the 4th Annual CBS Television Studios Summer Soiree held at Palihouse on Thursday night (June 2) in West Hollywood, Calif. The two Reign stars were joined by Megan Fellows on the step and repeat before hitting the party. Jane The Virgin stars Yael Grobglas, Justin Baldoni, his wife Emily, Brett Dier and girlfriend Haley Lu Richardson, and Ivonne Coll were also spotted at the annual event. Just a few days before, Yael celebrated her 32nd birthday. “Birthday done right! With lots of people I love at a beautiful place with beautiful food :) thank you for making my day so special everyone.. And thank you for the beautiful wishes, they mean everything,” she wrote on Instagram. 'Jane the Virgin' Season One is Coming to Netflix! Get ready to binge-watch Jane the Virgin! The first season of the award-winning CW comedy will be available on Netflix starting on Monday, October 12, which is the same day as the season two premiere! Meanwhile, Jane (Gina Rodriguez), Rafael (Justin Baldoni), Michael (Brett Dier), Rogelio (Jaime Camil), Xo (Andrea Navedo), Petra (Yael Grobglas), and Alba (Ivonne Coll) all just got new character portraits as well! Check them out below! And be sure to tune into Jane the Virgin season two premiering on Monday, October 12 @ 9/8c on The CW! Andrea Navedo speaks on stage after winning the Best Supporting Television Actress award at the 2015 Imagen Awards held at The Dorothy Chandler Pavilion on Friday night (August 21) in Los Angeles. The 37-year-old actress, joined by co-star Ivonne Coll, picked up the honor for her role as Xo on Jane The Virgin — in fact, the show won BIG at the ceremony. Jane The Virgin also picked up the Best Primetime Television Comedy Program and Best Television Actress for Gina Rodriguez, too. 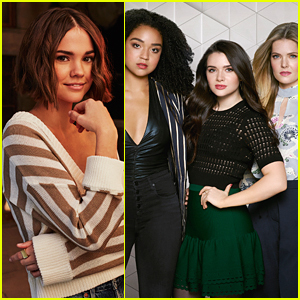 The Fosters‘ Cierra Ramirez and Sherri Saum and Parenthood‘s Xolo Mariduena are also pictured below. FYI: Cierra is wearing Maryam Shahbazi earrings. Sherri is wearing a Leanne Marshall dress. Xolo is wearing a Michael Kors tux and a Propper & Dapper handkerchief. 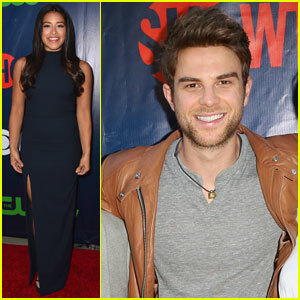 Gina Rodriguez & Nathanie Buzolic Step Out for CBS' TCA Bash 2015! Gina Rodriguez is a navy blue beauty while attending the 2015 CBS, Showtime, & CW Summer TCA Party held at the Pacific Design Center on Monday evening (August 10) in West Hollywood, Calif. 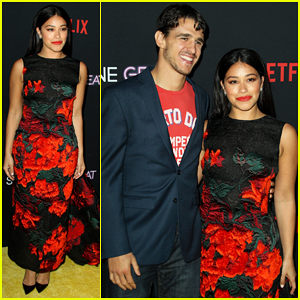 The 31-year-old Jane the Virgin star was joined on the carpet by her co-stars Brett Dier (with girlfriend Haley Lu Richardson), Andrea Navedo, Jaime Camil, Yael Grobglas, and Ivonne Coll. Also in attendance was the cast of Significant Mother, including Nathaniel Buzolic, Josh Zuckerman, Emma Fitzpatrick, Jay Ali, and Jonathan Silverman. FYI: Gina is wearing an Elizabeth and James top and skirt with Doves earrings, Le Vian and Djula rings, and Stuart Weitzman shoes. Gina Rodriguez oozes elegance as she arrives for the 2015 Critics’ Choice Television Awards held at The Beverly Hilton Hotel on Sunday night (May 31) in Beverly Hills, Calif. 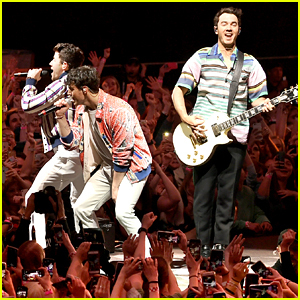 The 30-year-old actress was joined at the show by her Jane The Virgin co-stars Andrea Navedo, Jaime Camil, Justin Baldoni and Ivonne Coll. Jane The Virgin is still up for Best comedy series and Best actress in a comedy series for Gina. Jaime was nominated for Best supporting actor in a comedy series, but lost to Silicon Valley‘s TJ Miller. FYI: Gina wore a Reem Acra Couture dress, Stuart Weitzman heels and Edie Parker clutch. Andrea wore a Faviana dress, vintage clutch and Roni Blanshay earrings.